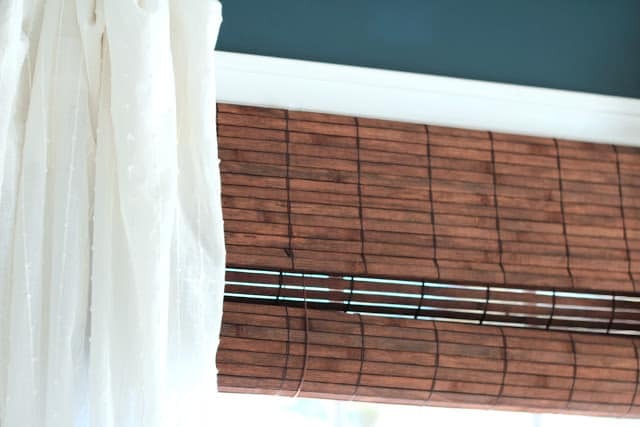 Bamboo blinds are such a great way to add texture and warmth to a room and as an added bonus, they can be really affordable too. just because something is affordable doesn’t mean it has to look cheap. From the picture above, all that jumps out at me is the hanging hardware. This shade would look so much better without the hooks that attach it to the window exposed, wouldn’t it? 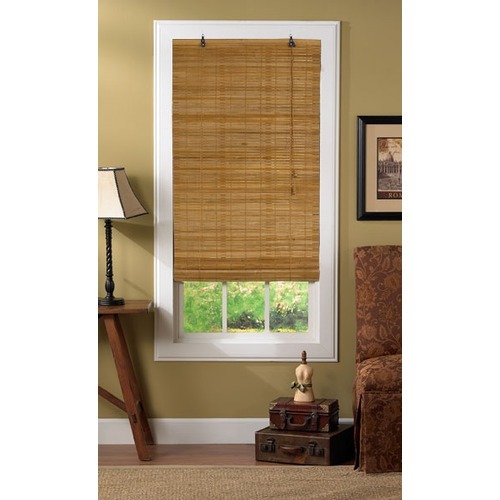 We have both these bamboo roman shades and these bamboo roll up shades in our house. 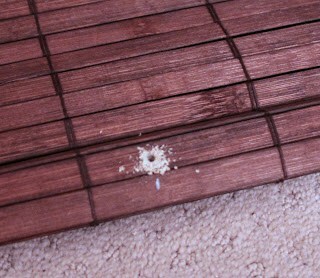 The roll up version is much less expensive, but they come with a ridiculous system for hanging them that is also common on inexpensive matchsticks blinds. 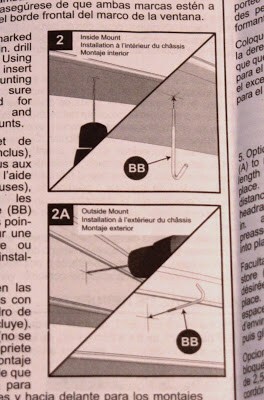 Two flimsy triangle hooks are attached to the top of the shade. 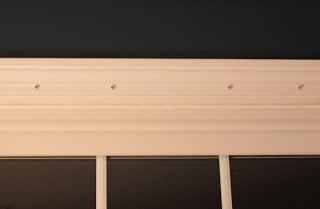 An L-shaped metal piece is screwed into the window frame and the triangles are attached to them. 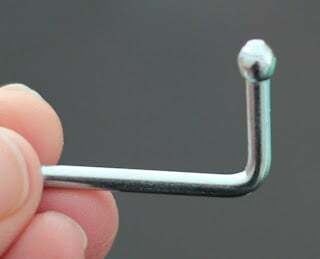 This is the L-shaped bracket which extends out a good inch. 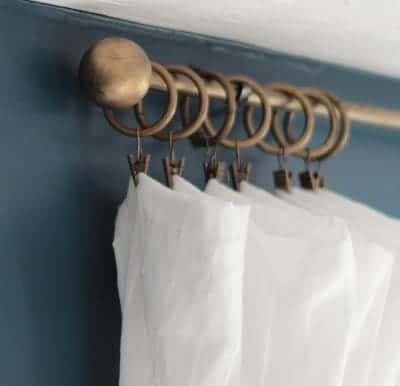 In my bathroom, I opted to drill a screw into the wall and hang the triangle hook on that, hoping to disguise it close to the wall, but it was still very visible from anywhere in the room. To hide the hardware altogether, I removed the triangle hooks that came on the shades and installed new ones that are behind the shade vs. on top of it. It worked like a charm, so I thought I’d share it with you. 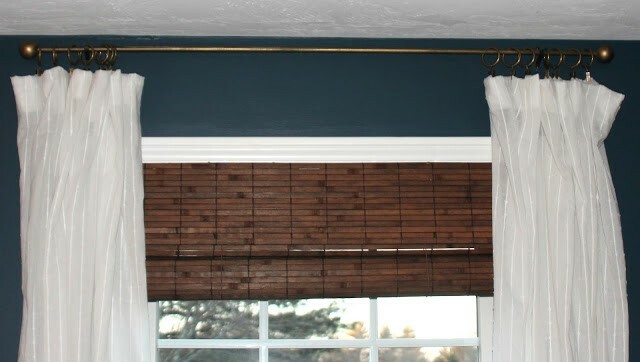 make sure you invest in a shade that has a valance on the top. This valance covers the string mechanism that raises and lowers your shade. 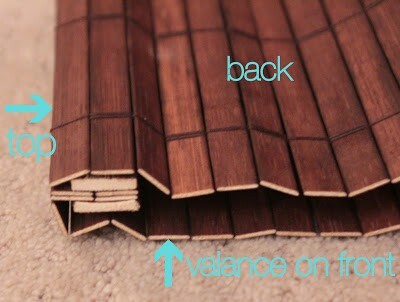 I noticed some of the shades by the same manufacturer have the valance and some don’t – so make sure you check. if your new shade has the cheesy triangle hook/L-shaped screw hanging system, hack it a little to hide that cheap hardware. a drill and drill bit (I used the 3/32 drill bit for these screws – make sure your drill bit is smaller than the screw) – I love my rechargeable drill/driver! To start, place your shade face down like this. 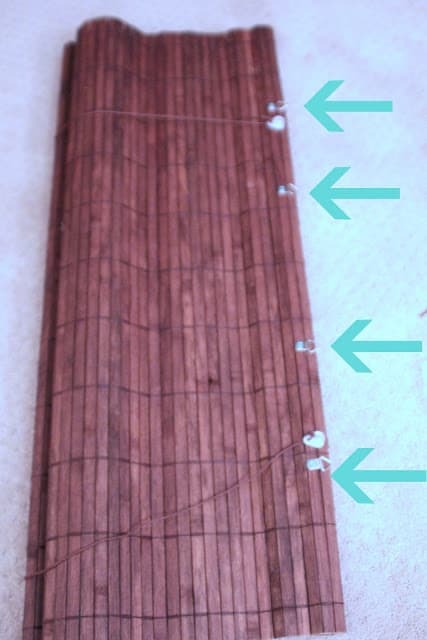 Remove the triangle hooks that are already on the shade: using two sets of pliers, clamp onto either side of the hook, pull it apart and discard. 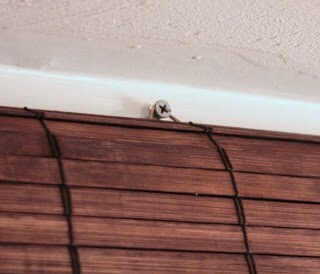 The shade came with only two hooks, but since these shades will be pulled up and down on a daily basis, I placed four across the top of my shades for durability. Find the center of your window, mark it, and mark your hook measurements accordingly. 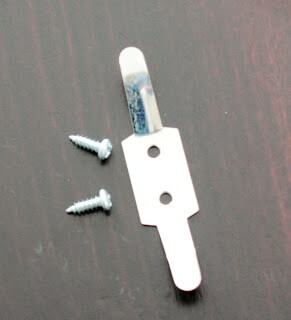 Place four screws on the markings…. then hang the triangle hooks, and voila. Now lets talk about the cleat that holds the cord. Does anyone on this earth like these things? 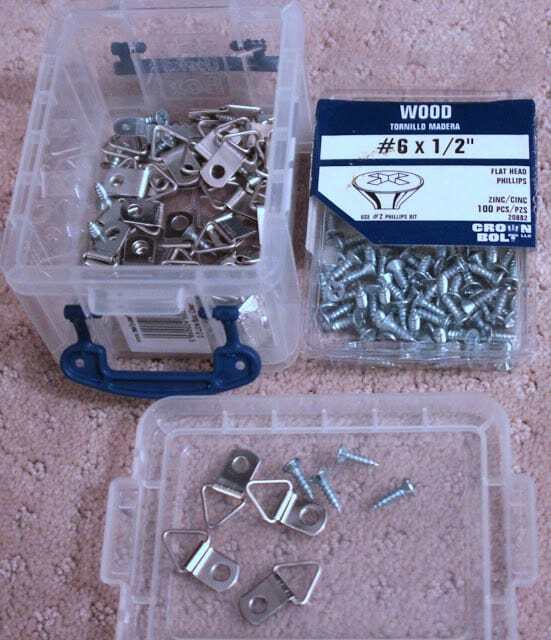 Those tiny screws that come with it??? The fact that you have to wrap the cord around it 75 times??? 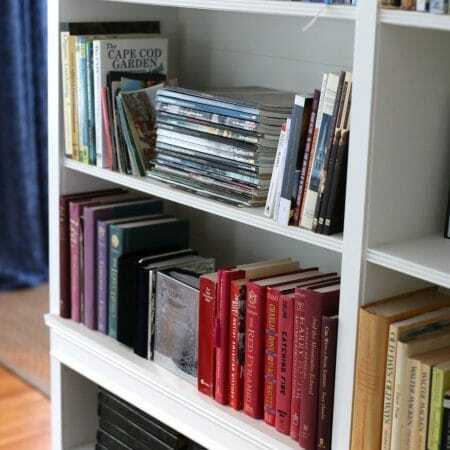 However, they are important if you have young kids in your home since shade cords present a risk of strangulation. I also feel like the dangling cord detracts from the look of a shade. 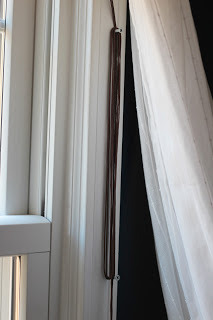 If your shade will be flanked by curtains, forgo the little annoying cleat, and simply hide the cord (and more importantly, keep the younguns safe) by screwing two longer screws into your window frame, about 10-12″ apart. The cord wraps around the two screws only 2 or 3 times and takes about 5 seconds when I pull up the shades in the morning. The final affect is a less cluttered, more finished look. 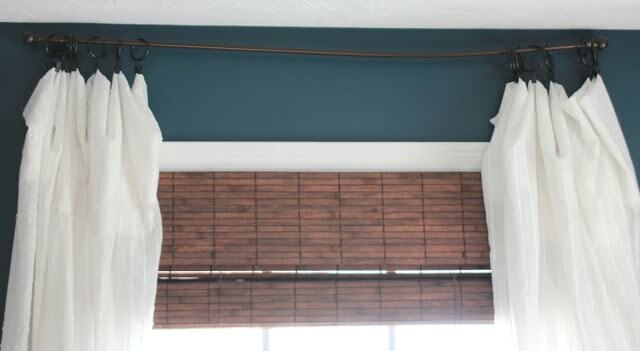 The hardware is hidden on the bamboo shades, but what about this curtain rod???? Wow, sweet right?!!!!! 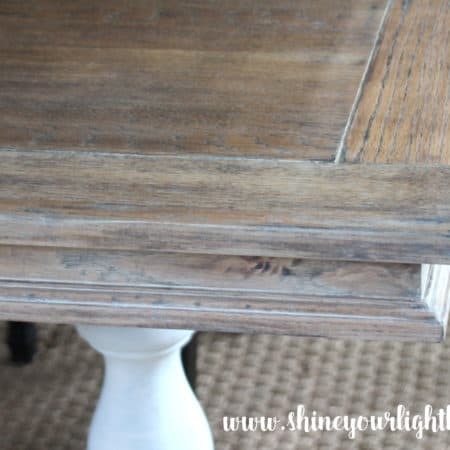 Check out how I DIYed new rods with an antique brass finish and a fun idea for those ball finials! Lisa, you are so smart. I love bamboo blinds too for the texture. Thanks for the tutorial! You are brilliant! I always thought that the hardware that comes with those shades is definitely lacking. 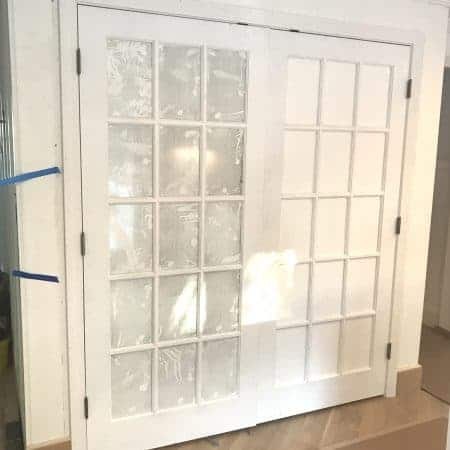 I'm in the market for some in my bedroom, and I may need your trick! I love this stuff….never boring to me. A very creative solution, and they look expensive. Sad rod, can't wait to see how you fixed that one. Thanks for the this post, I'm thinking of buying them for my livingroom! So THAT'S how to do it!! Maybe I should reconsider those inherited blinds. Well, it isn't exactly the WOW! 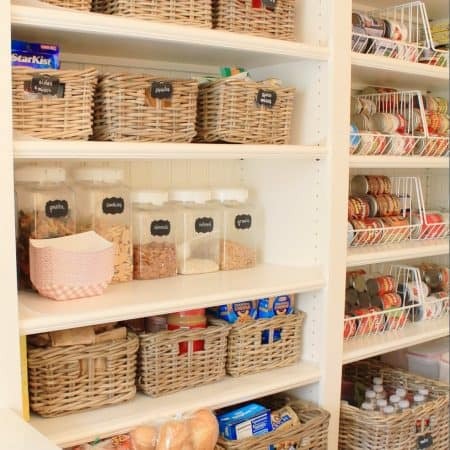 of newly painted black doors, or one of your mouthwatering recipes, but SO helpful and it looks SO much better! I wouldn't have even thought about it until it was too late!! DYI in my book, Lisa! You are full of great tricks and tips. What a smart idea. I love your blinds too! Awesome! Thanks for sharing. This may prove very helpful in the near future. Great idea! Looks SO much better with that hardware hidden. I am in the market for bamboo blinds. I’ve heard good things about it and I like the idea of hiding the hardware. I actually hadn’t noticed it till it was mentioned but it would be pretty cool not to see the hardware.